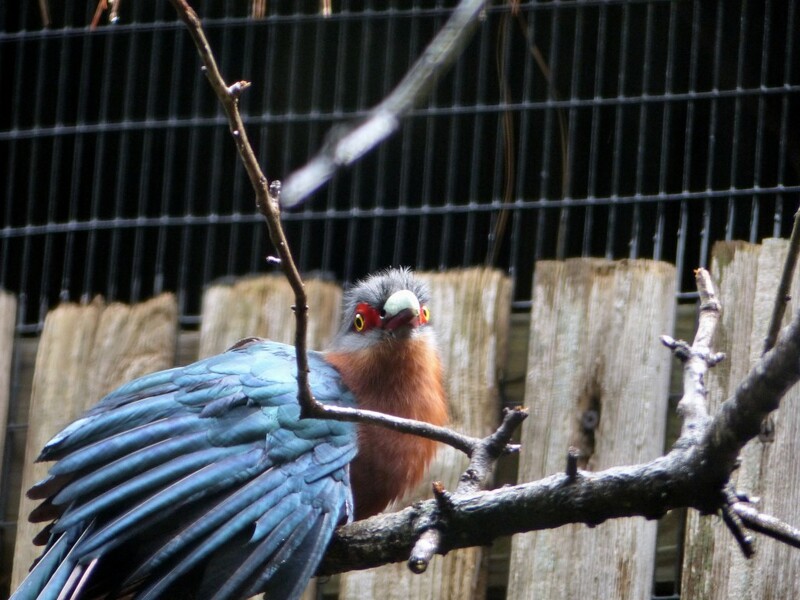 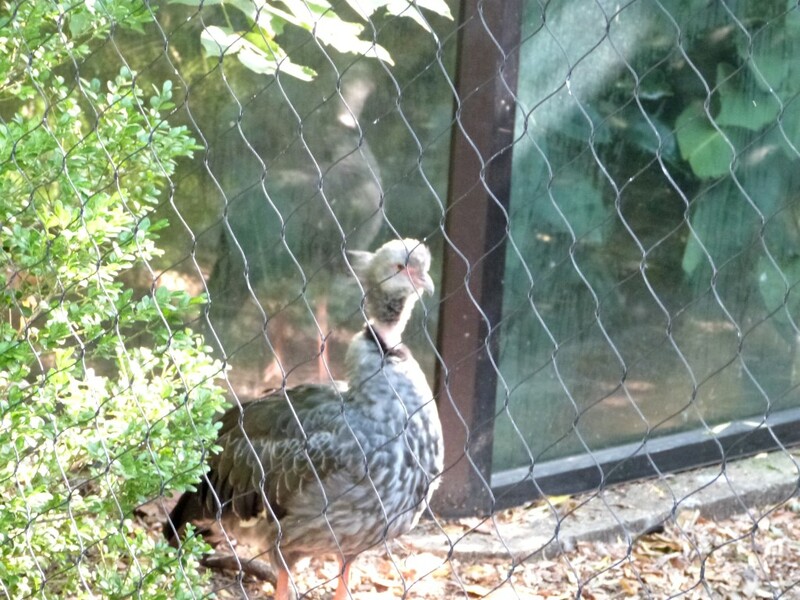 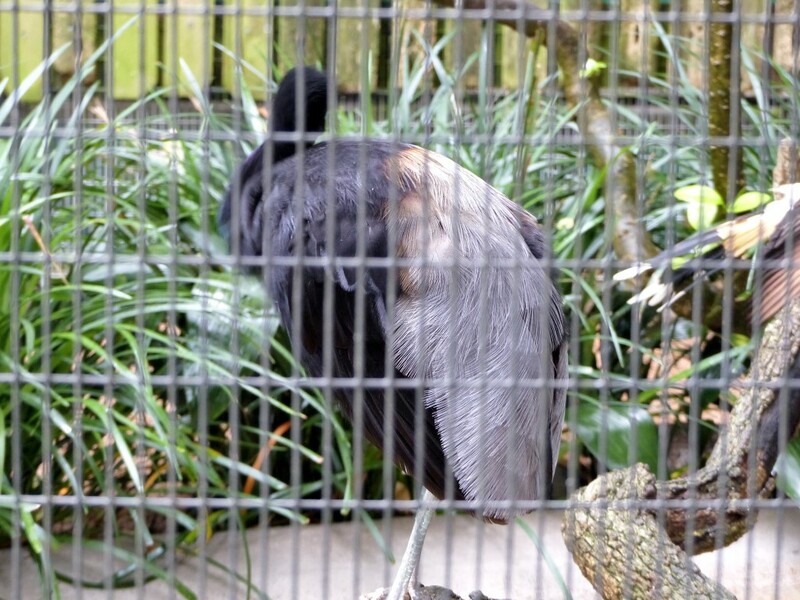 Yesterday, we had the pleasure of checking out more birds of the Lord’s creation at the Cincinnati Zoo. 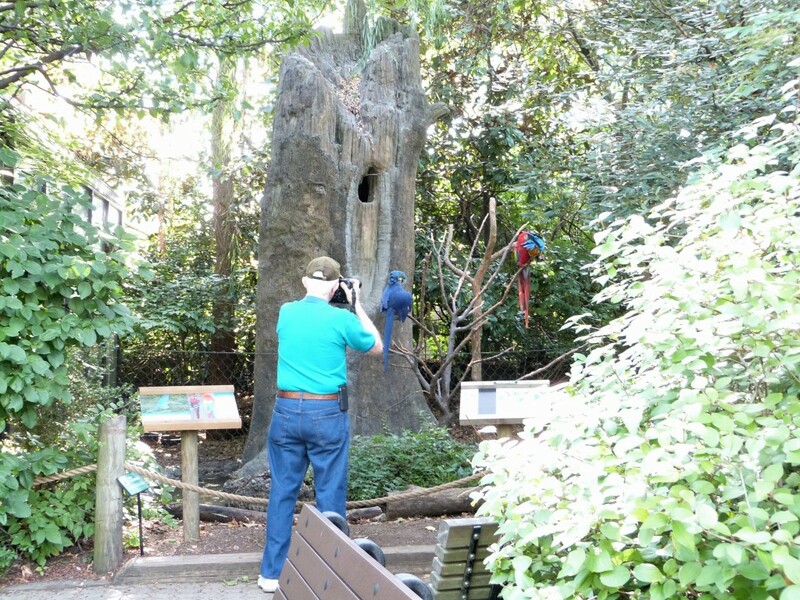 The weather and the temperature were great and the birds were quite content to let us watch and photograph them. 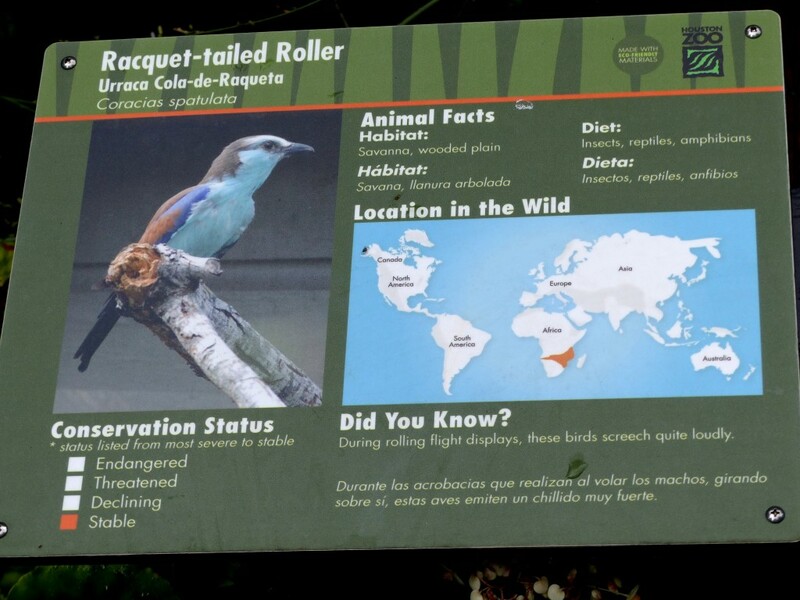 It has been over 45 years ago since we visited this zoo. 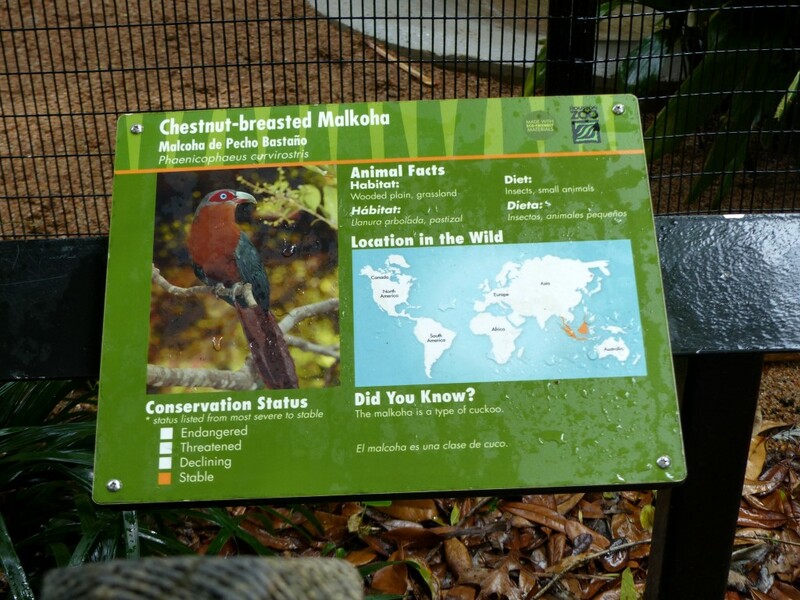 Needless to say, it has changed and the most striking was their beautiful landscaping throughout the zoo. 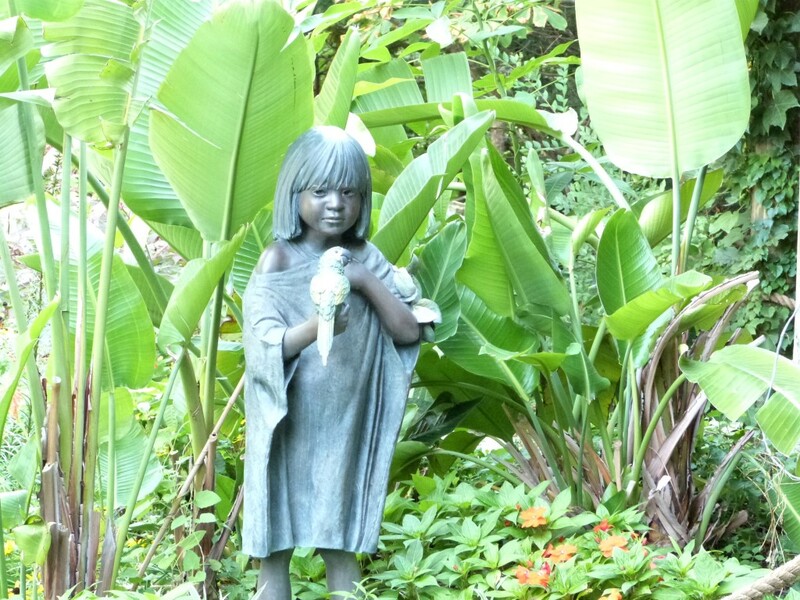 Statue at the entrance to the Wings of the World exhibit. 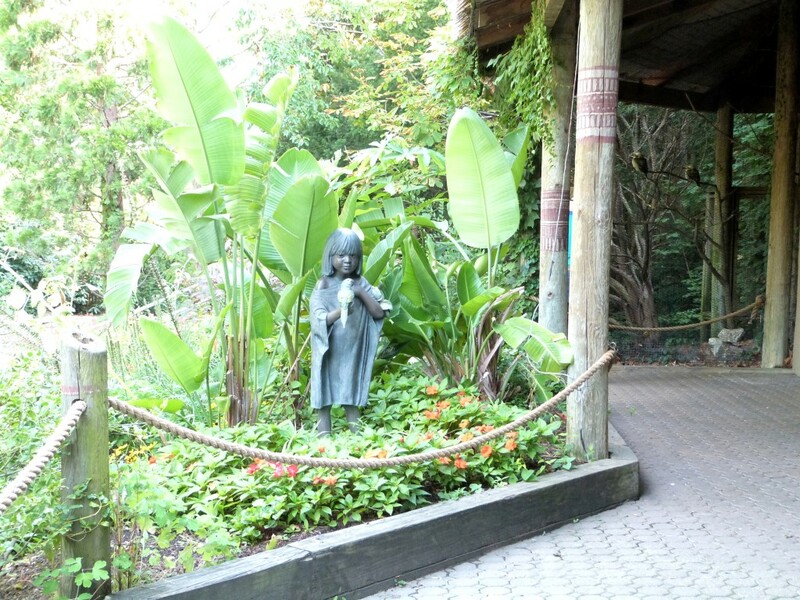 When we arrived at the Wings of the World area, We were greeted by several birds and a neat statute of a child holding a bird. 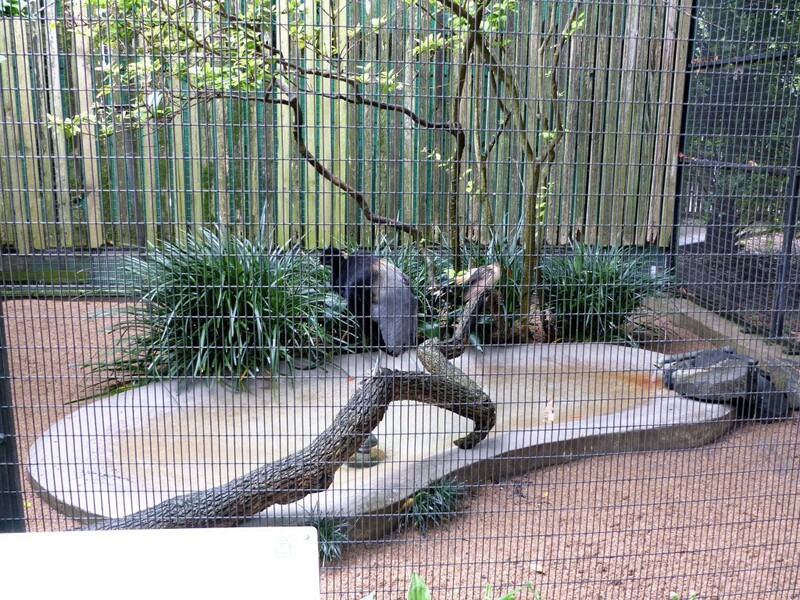 This shows how some of the landscaping was used around the zoo. 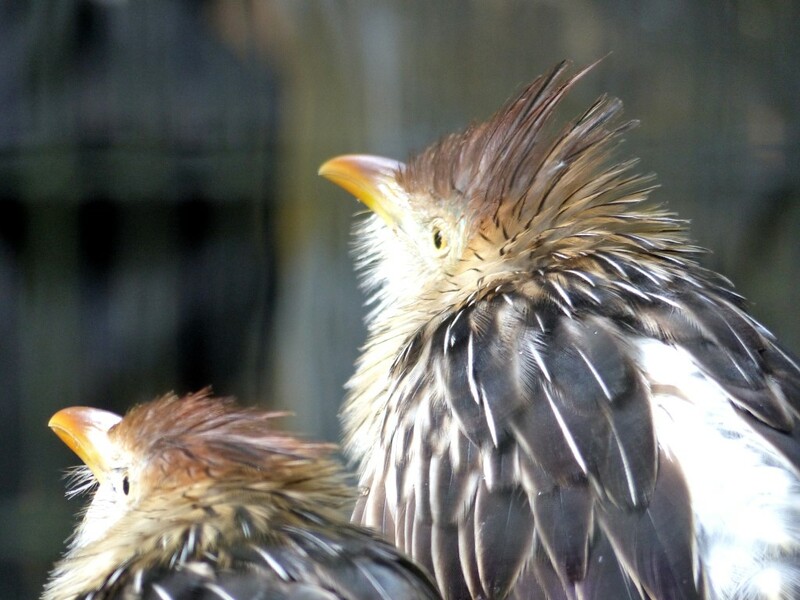 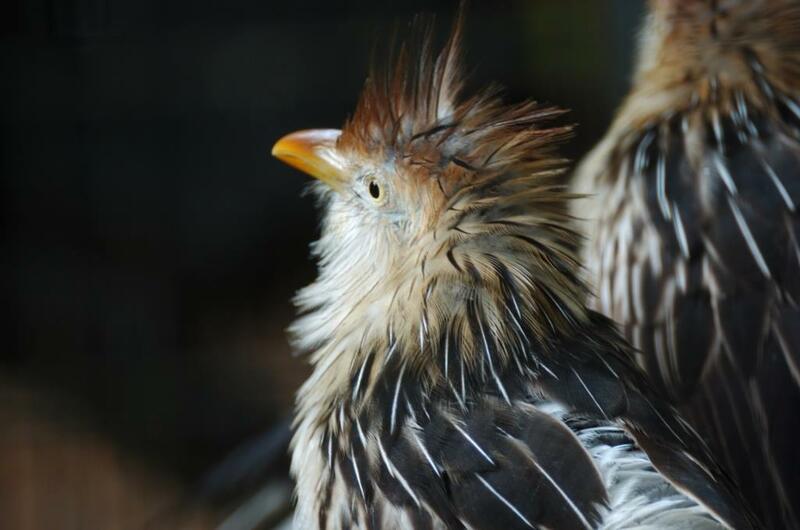 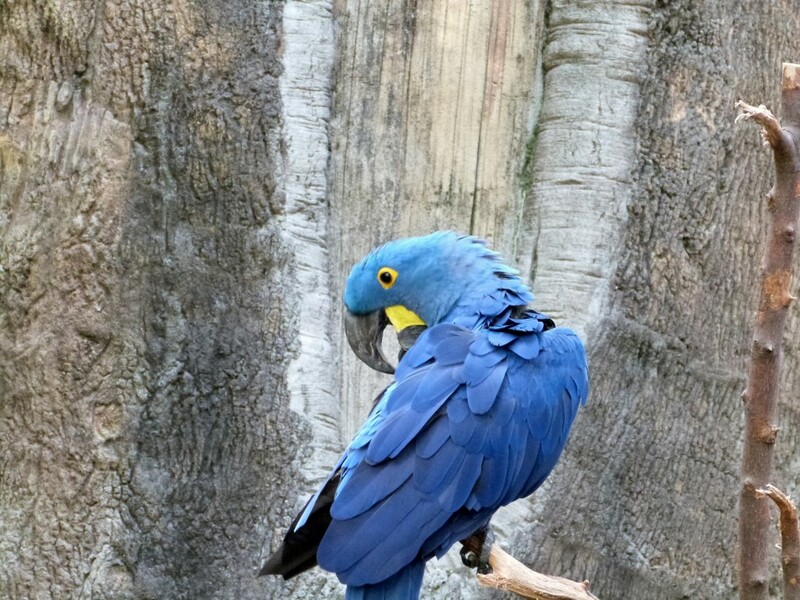 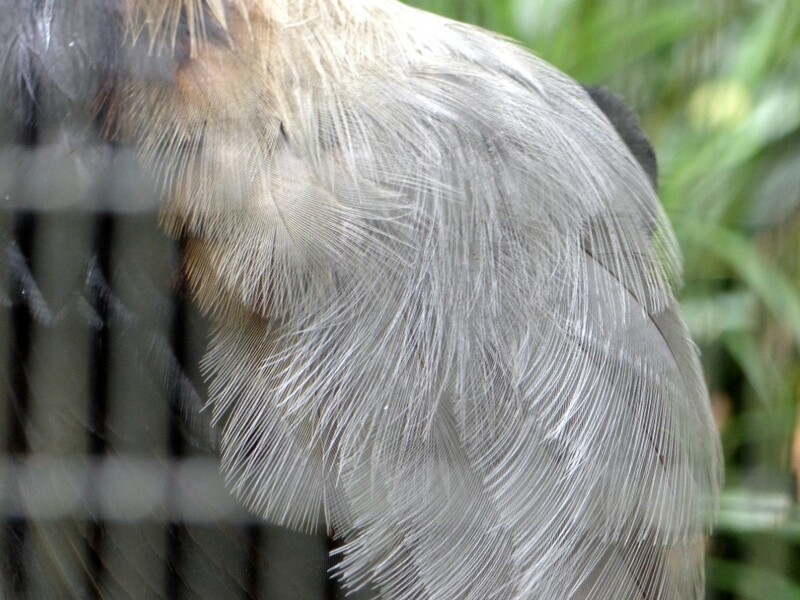 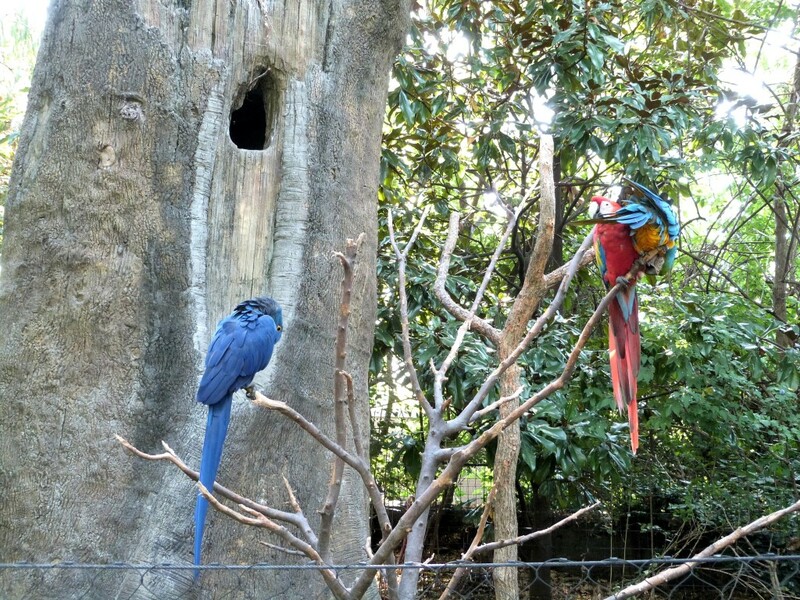 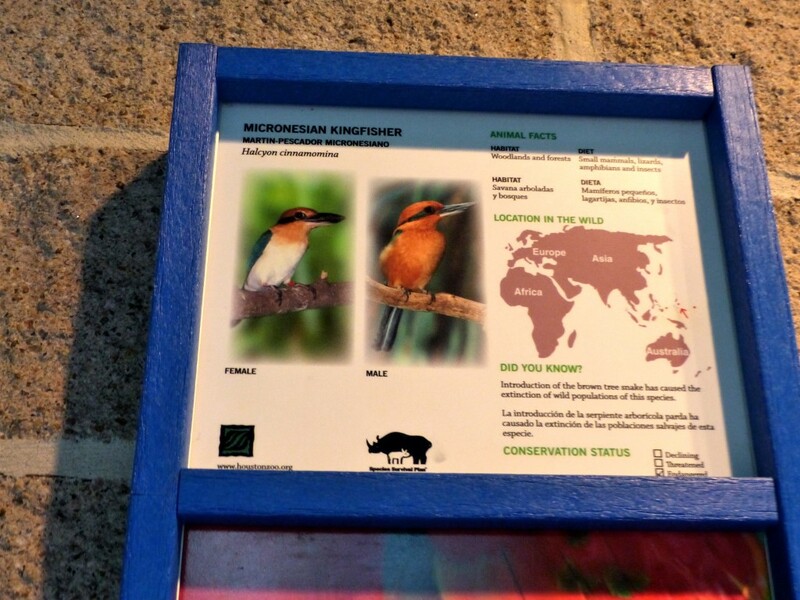 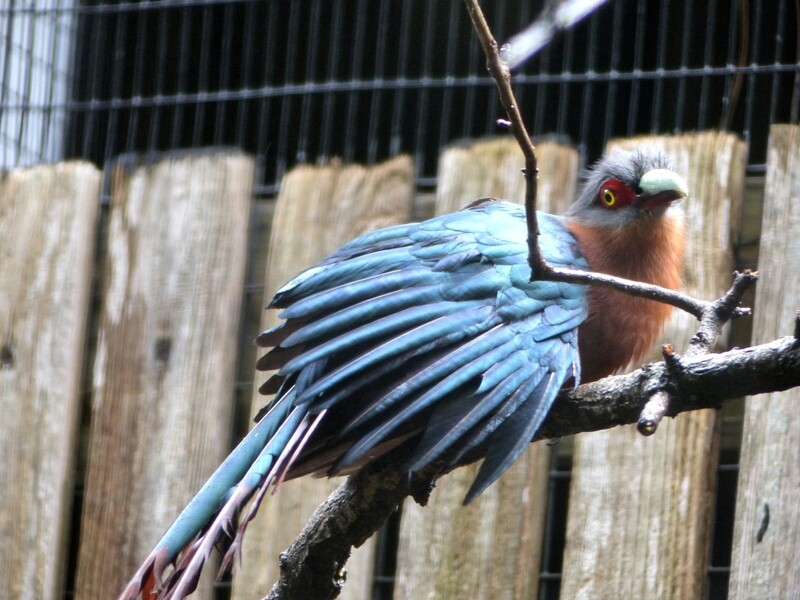 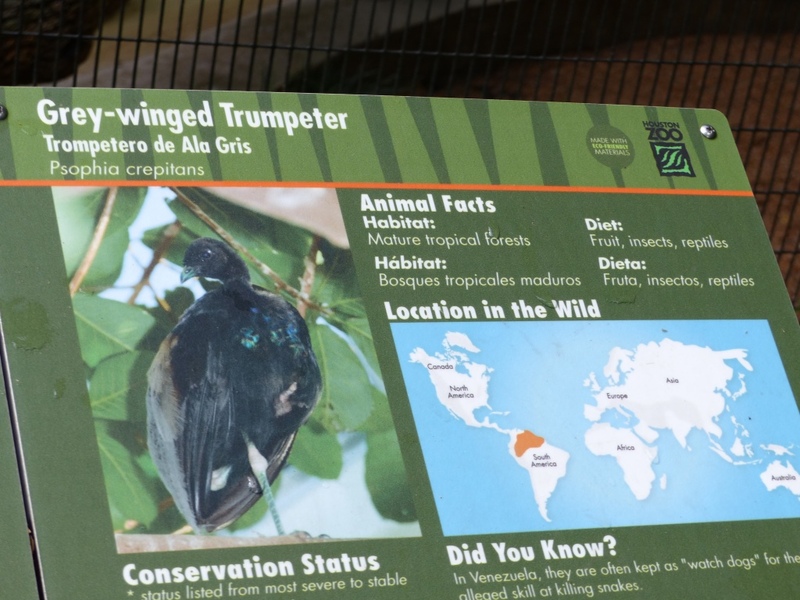 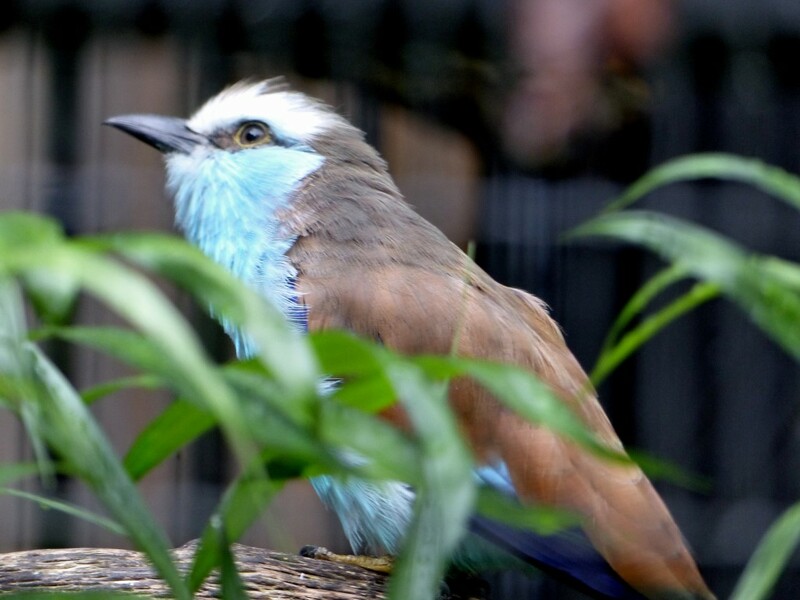 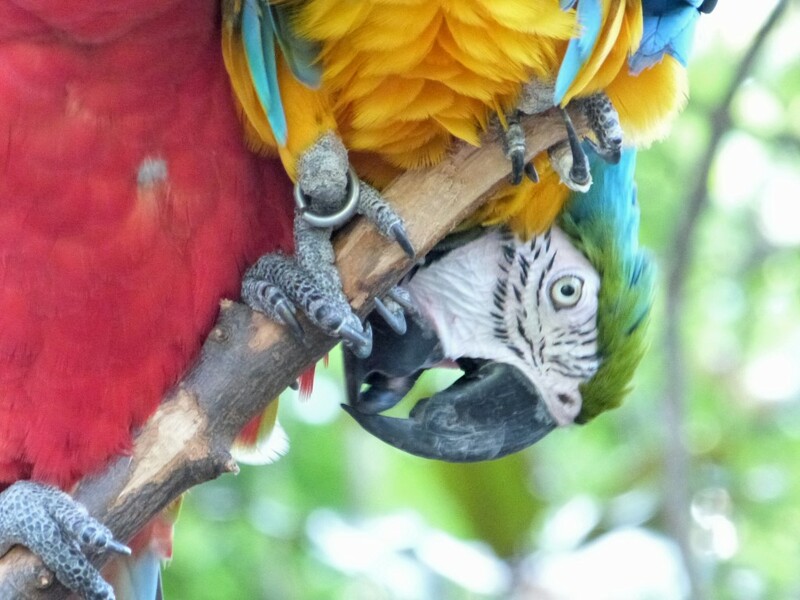 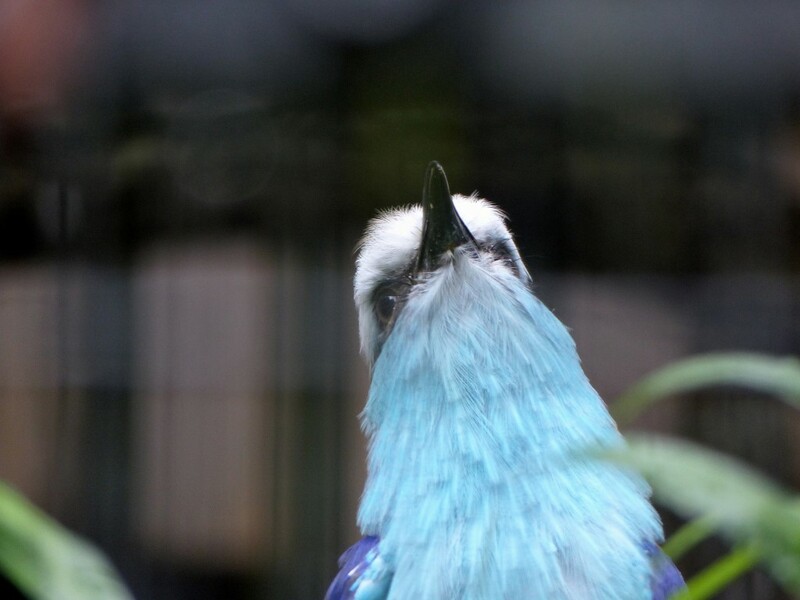 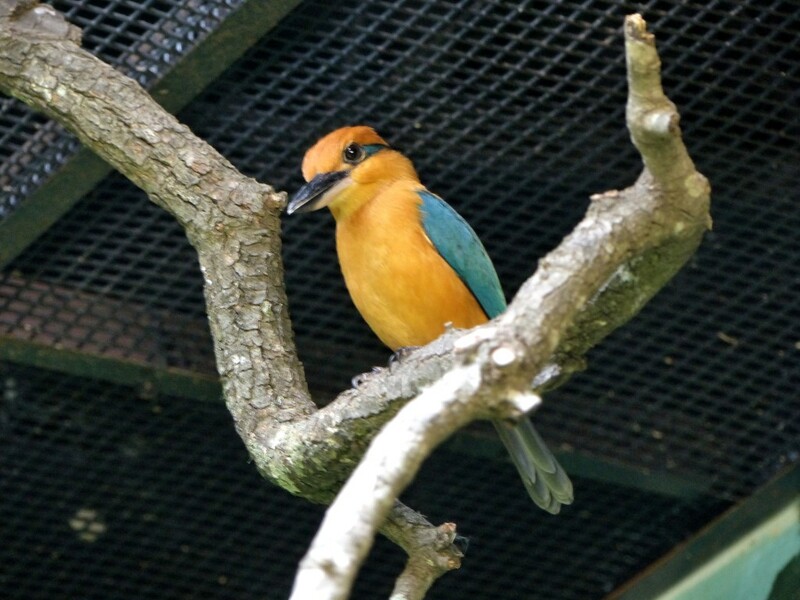 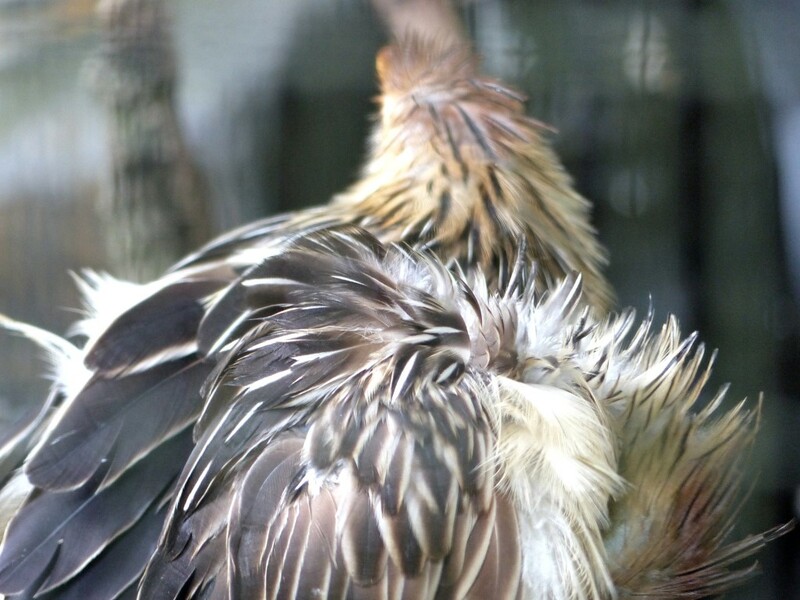 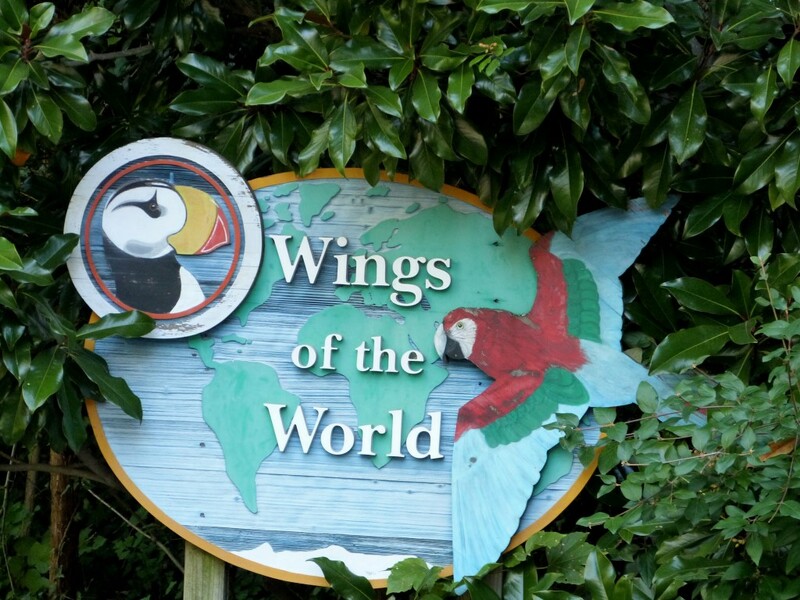 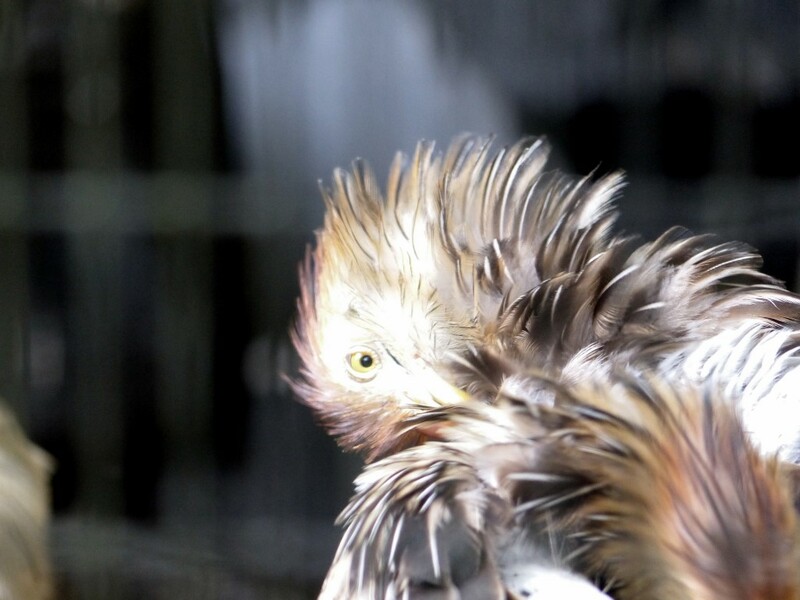 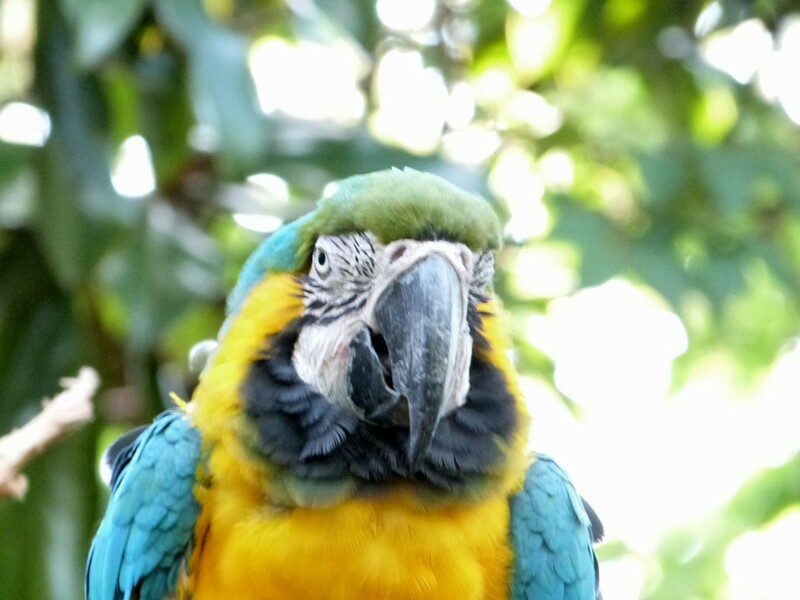 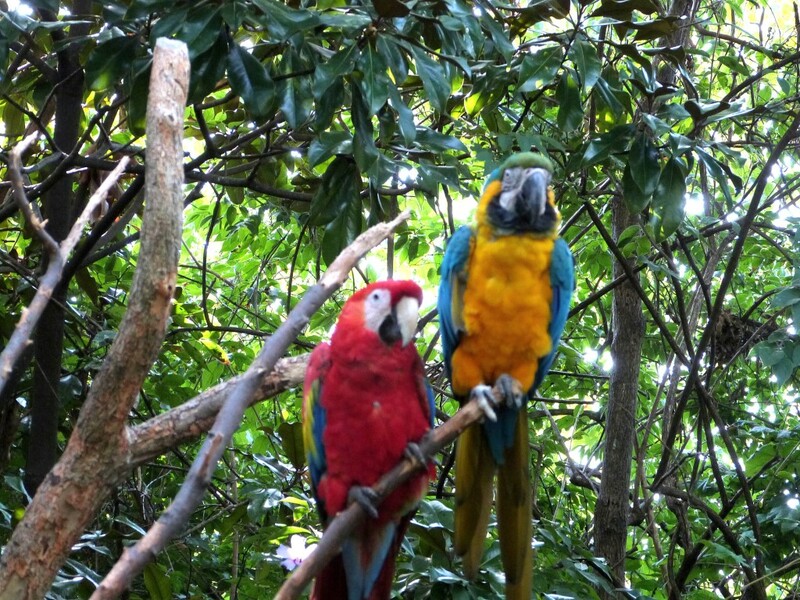 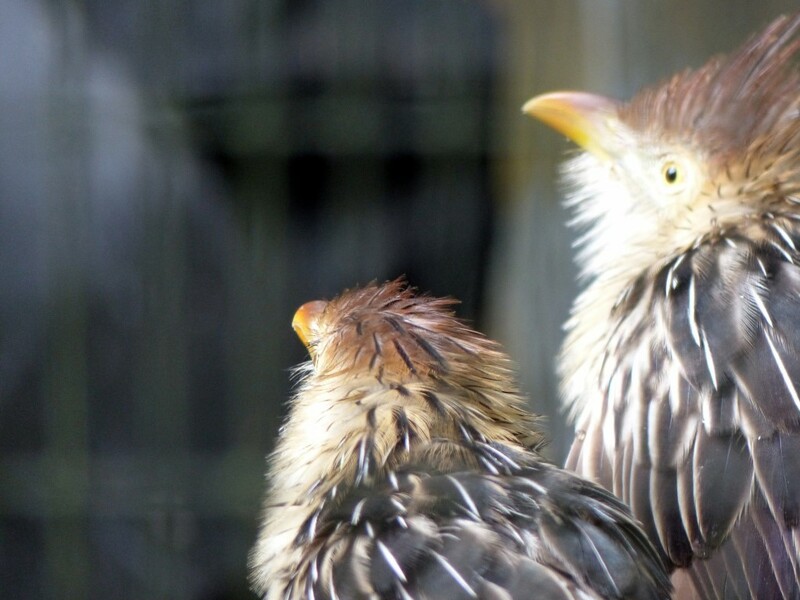 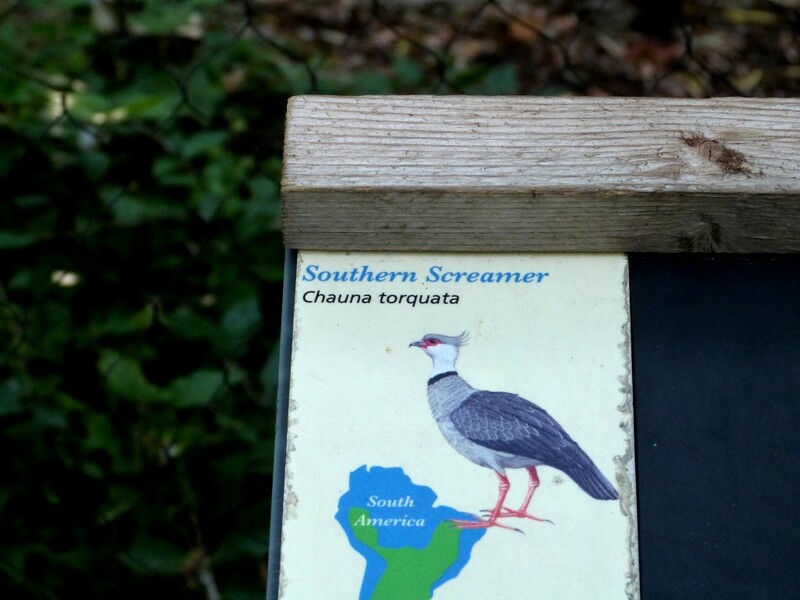 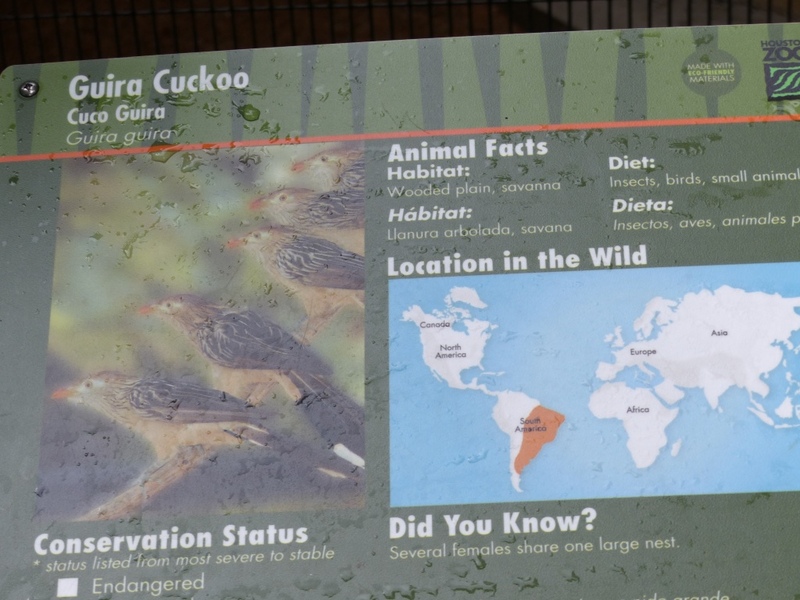 Wings of the World Aviary is divided into several different habitats and types of birds. 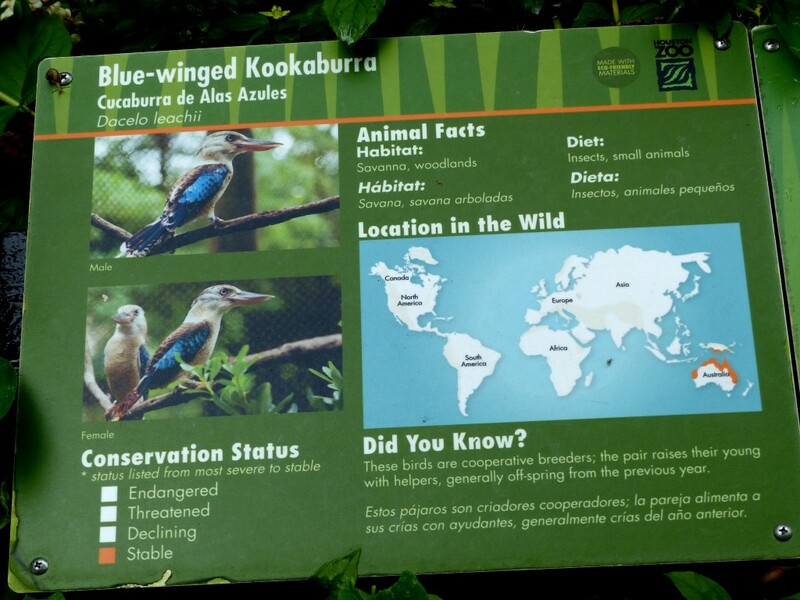 As you enter, you are greeted by Macaws, Screamers and a Laughing Kookaburra. 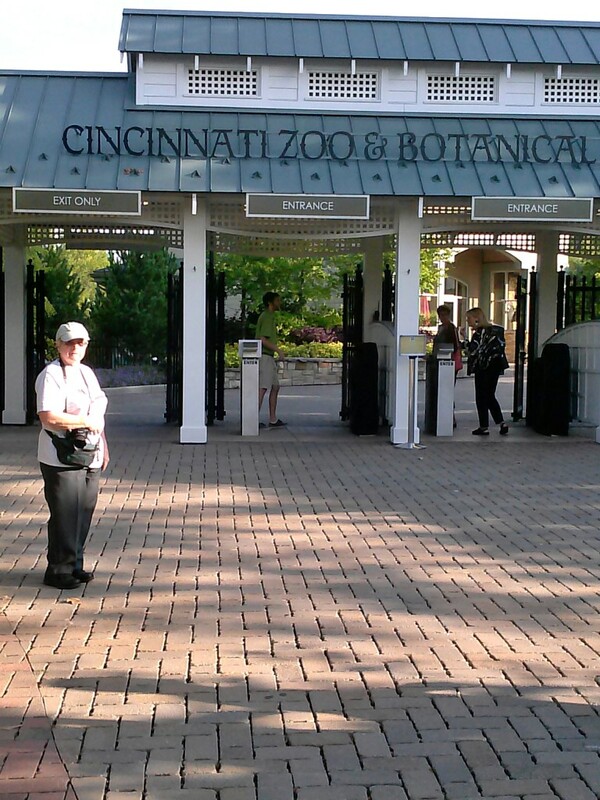 This is just the beginning of our visit to the Cincinnati Zoo. 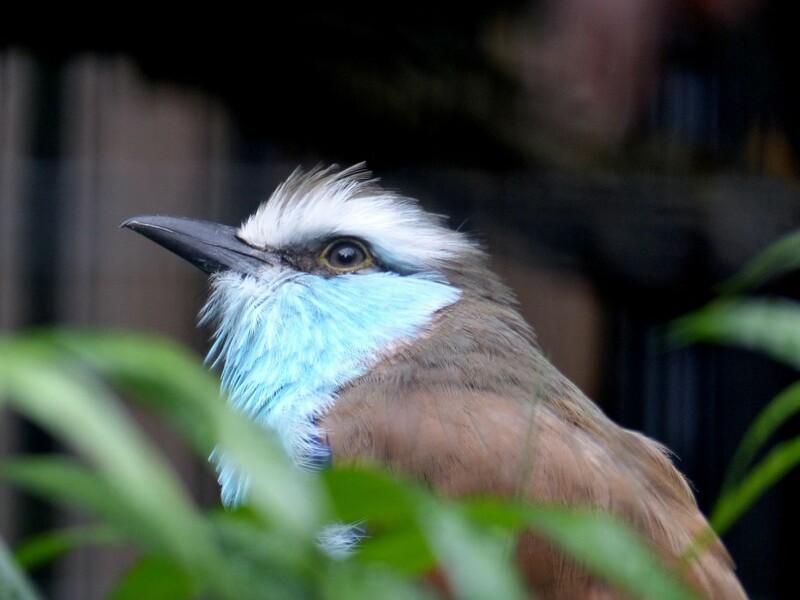 Look for more articles about some really neat birds like a Mousebird, Bee-eater, Bishop, Penguins, Murres and more. 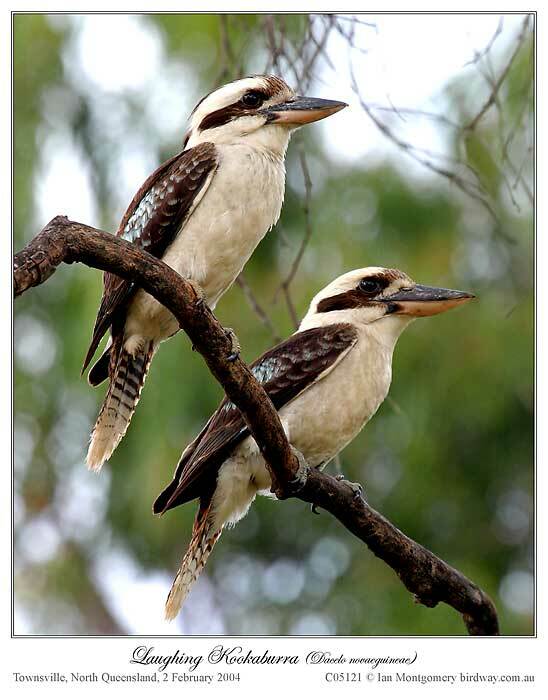 The Blue-winged Kookaburra has featured as bird of the week (twice) but, as far as I can detect, the iconic Laughing Kookaburra hasn’t, so let’s correct that using library photos. 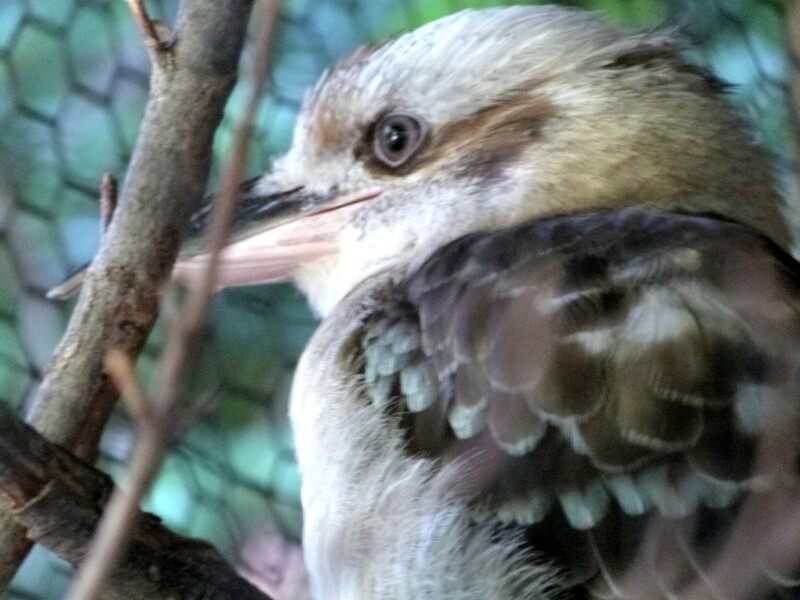 Bird photo opportunities were time-constrained during the wonderful recorder course in Armidale, NSW, though a family of roosting Southern Boobooks (which featured as bird of the week last year) gave the participants much pleasure and I’ll let you know when I’ve put the photos on the website. 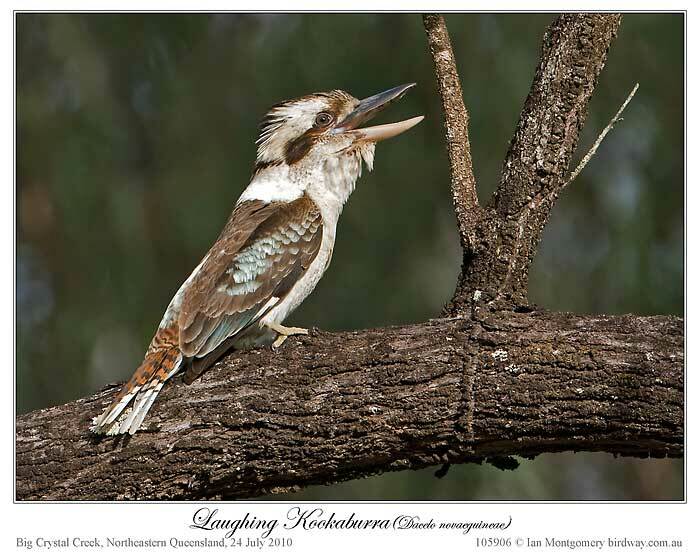 Its loud cackling call is a characteristic sound of the Australian landscape (and of the sound tracks of B-grade jungle movies not set in Australia) and it’s a familiar bird in southern and eastern Australia, first photo. 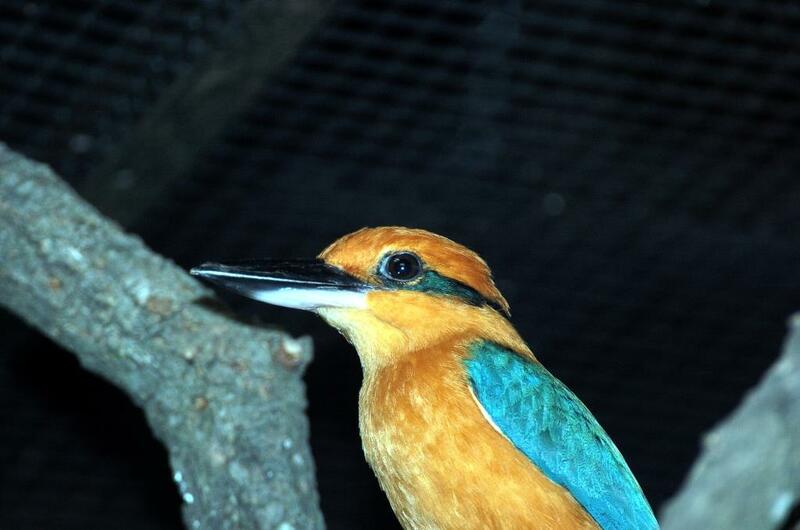 Up to 47cm/18.5in in length, it’s larger than its blue-winged cousin (length to 40cm) and by far the largest Australian Kingfisher. 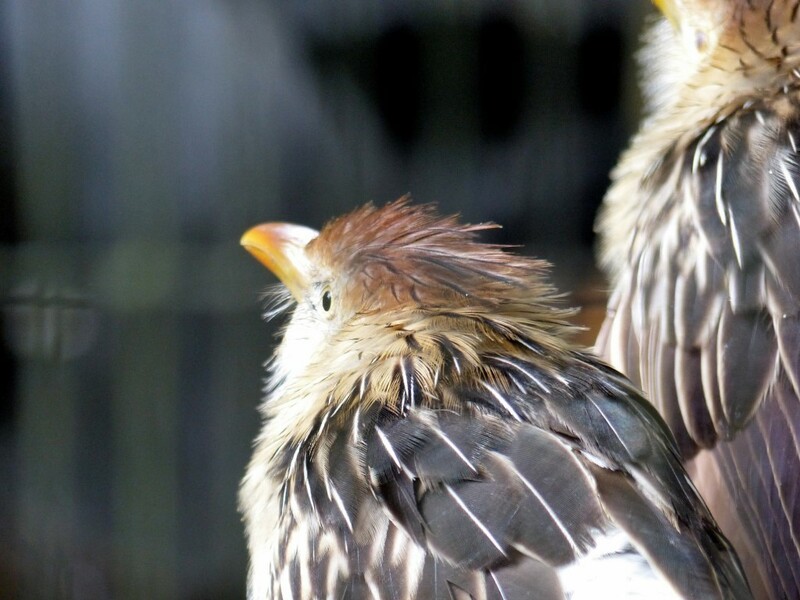 Unlike male blue-winged, birds of both sexes have brown tails and are not easily told apart. 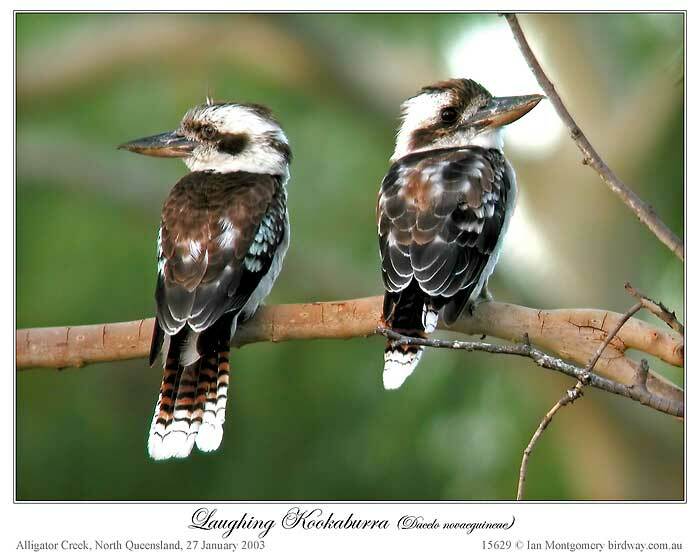 The third photo shows a breeding pair of Laughing Kookaburras, photographed near their nest site in a tree hollow in the botanic gardens (the Palmetum) in Townsville. 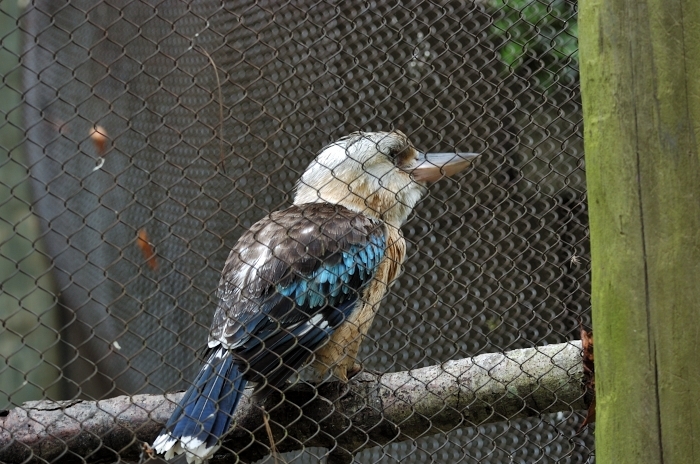 Older males can, however, be distinguished by having bluish rumps, like one making his presence very audible in the third photo. 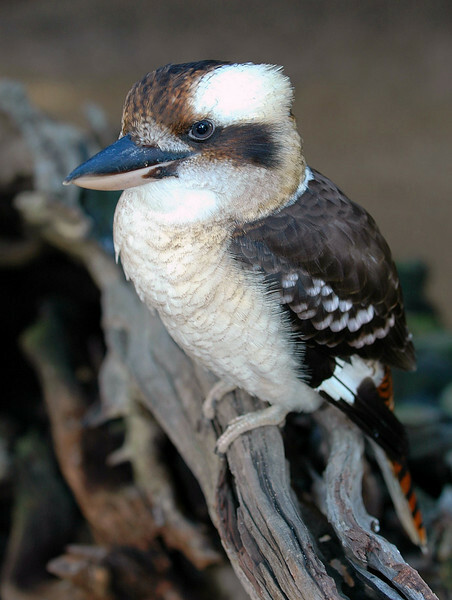 Kookaburras are very territorial and defend their territories by having calling matches and by performing circular display flights as far as the boundary of the territory. 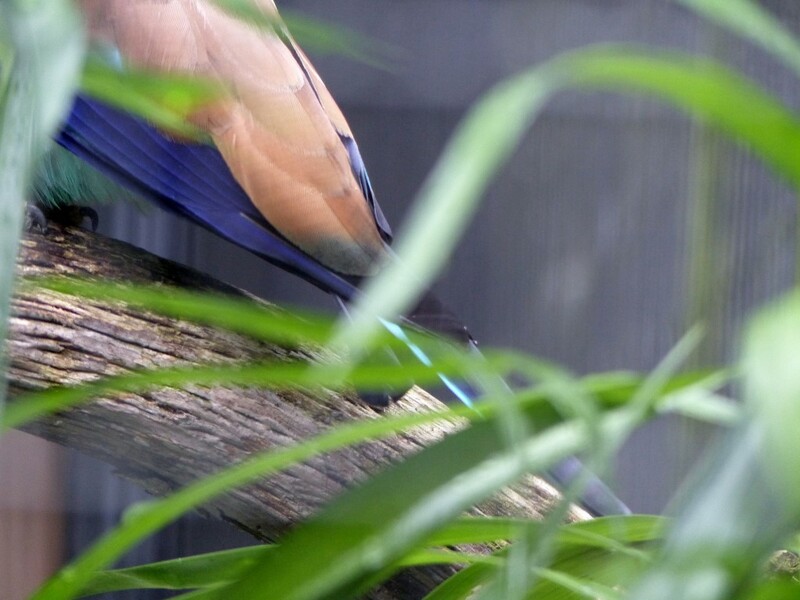 A territorial group consists of either just a breeding pair or a dominant breeding pair and several ‘helper’ birds so the calling matches can be very noisy indeed when everyone takes part. 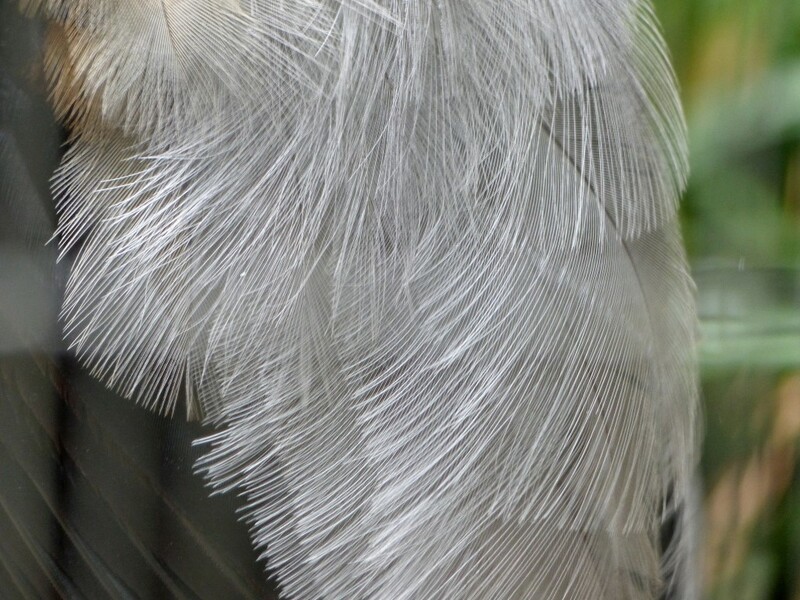 Juvenile birds are recognisable by the pale brownish scalloped edges to the plumage, most noticeable on the back like the right hand bird in the fourth photo. 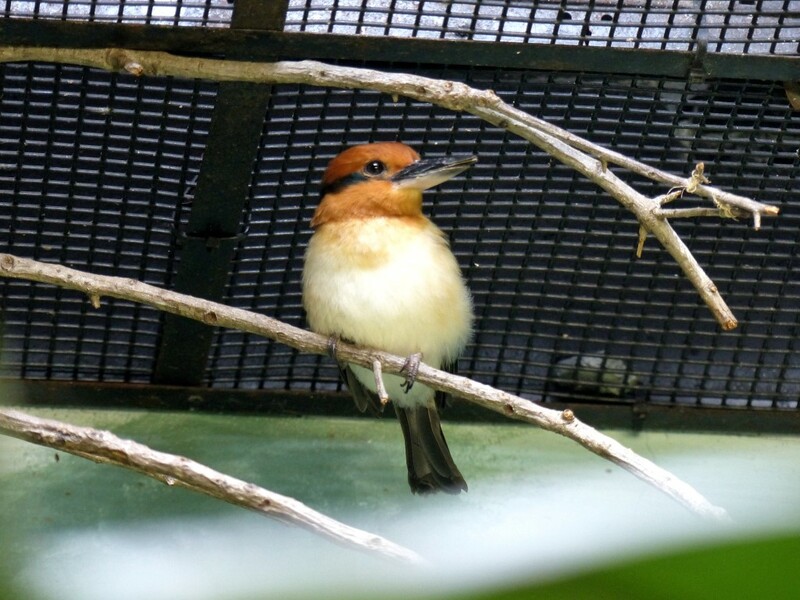 This bird is barely fledged and has a very short tail. 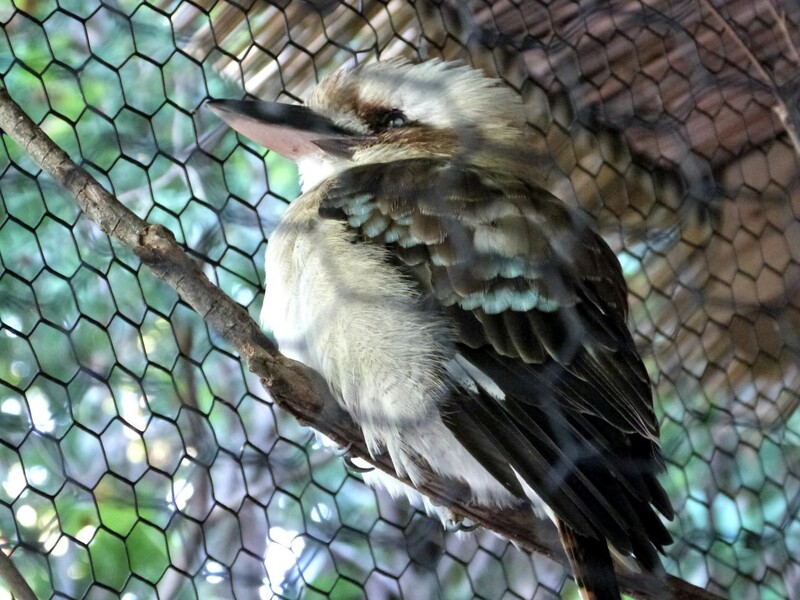 Kookaburras are carnivorous and they hunt from perches, doing long glides down to catch terrestrial prey, typically large insects and small mammals and reptiles. 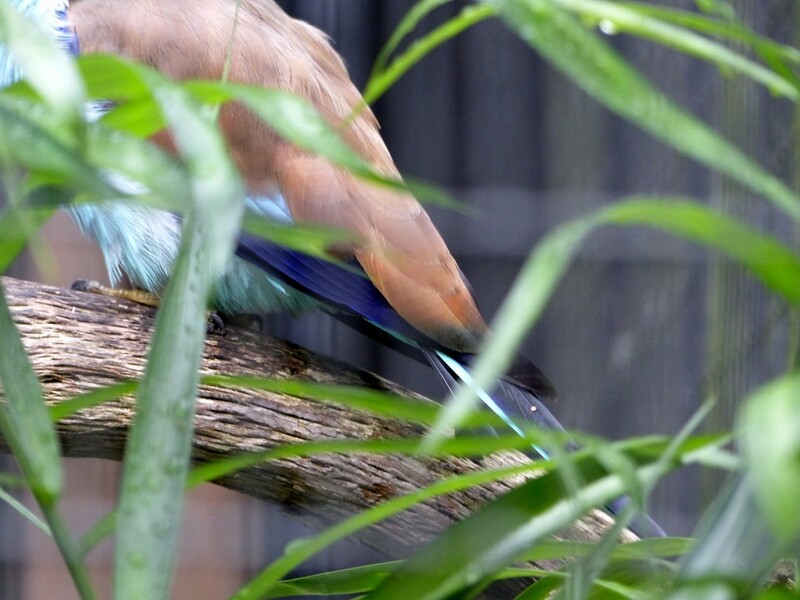 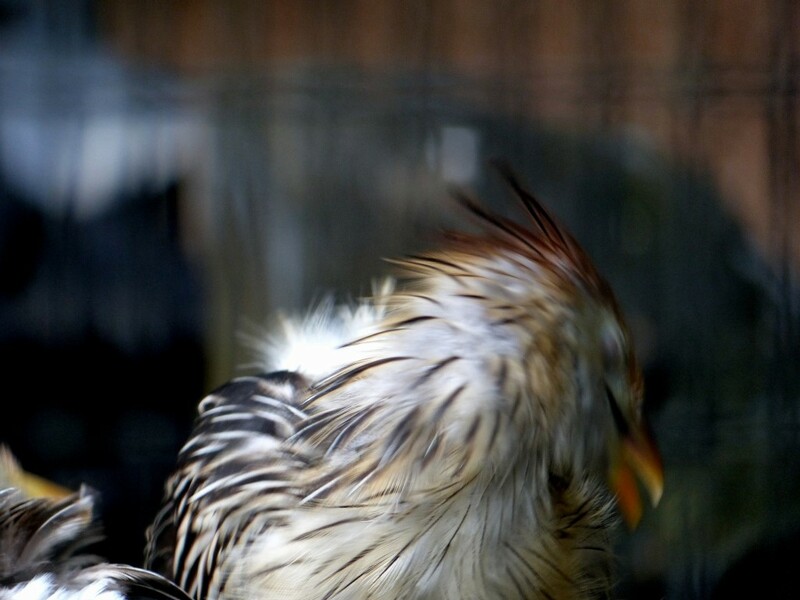 The bird in the fifth photo has just caught a mouse. 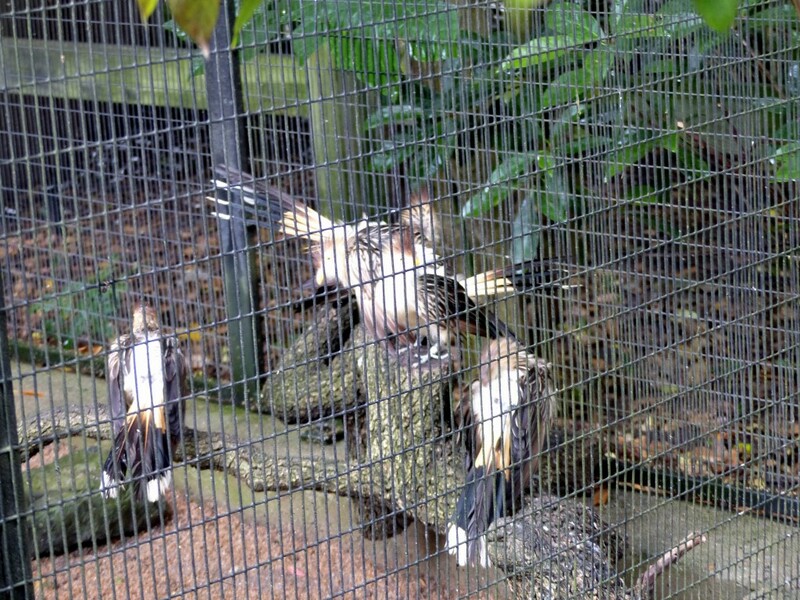 They will immobilise their prey by beating it on the perch, and will automatically do this even when fed dead food such as strips of meat. 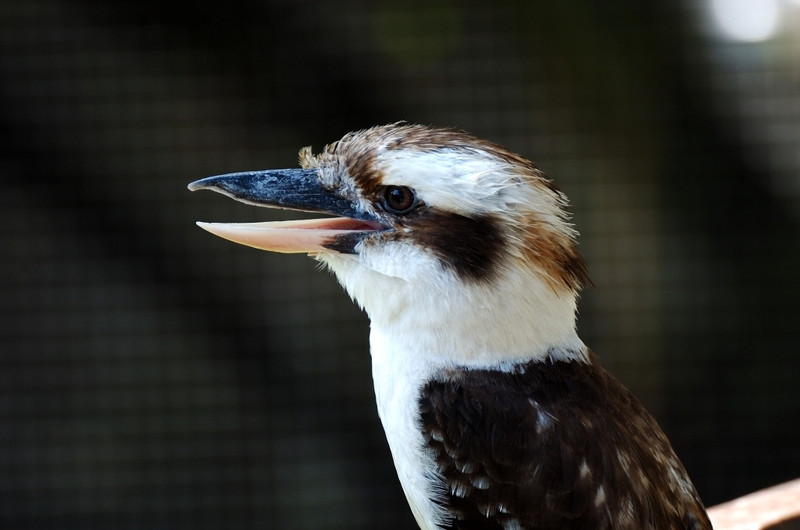 The original range of the Laughing Kookaburra comprised only mainland eastern Australia from the tip of Cape York in the north south to Victoria and as far west as eastern South Australia. 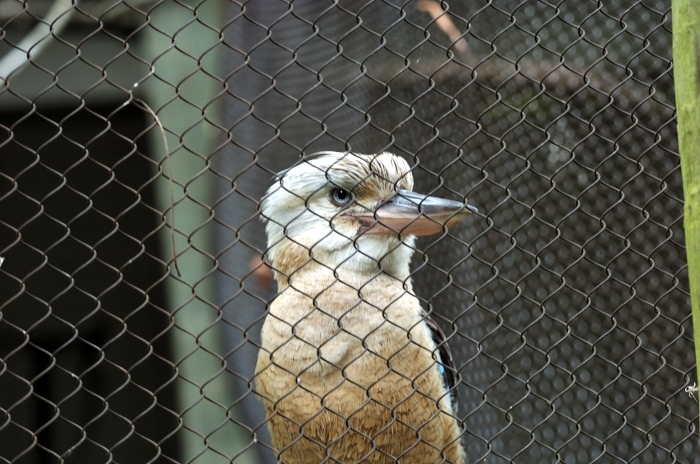 Since european settlement it has been successfully introduced to southwestern Western Australia, Tasmania, the islands in Bass Strait and Kangaroo Island in South Australia. 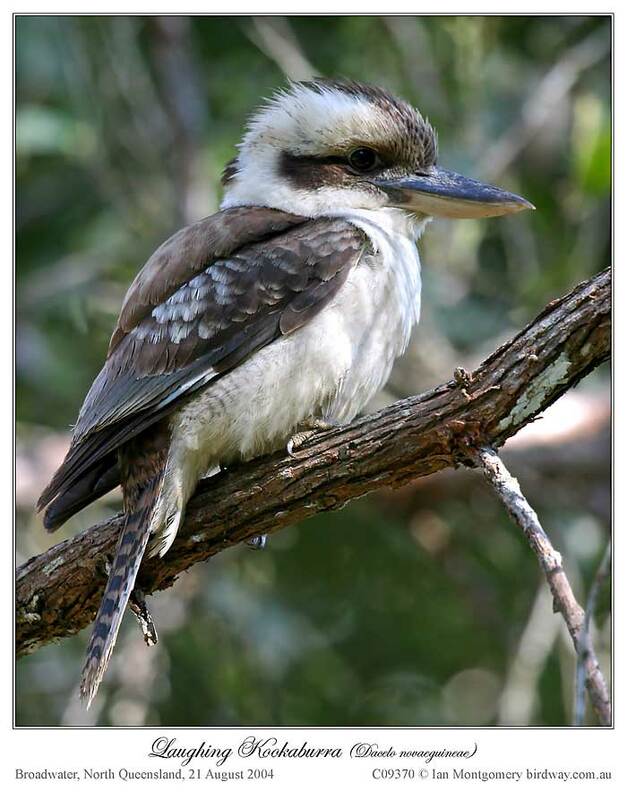 Unfortunately, in these areas it competes with the native wildlife for food and with species that nest in tree hollows such as Southern Boobooks. 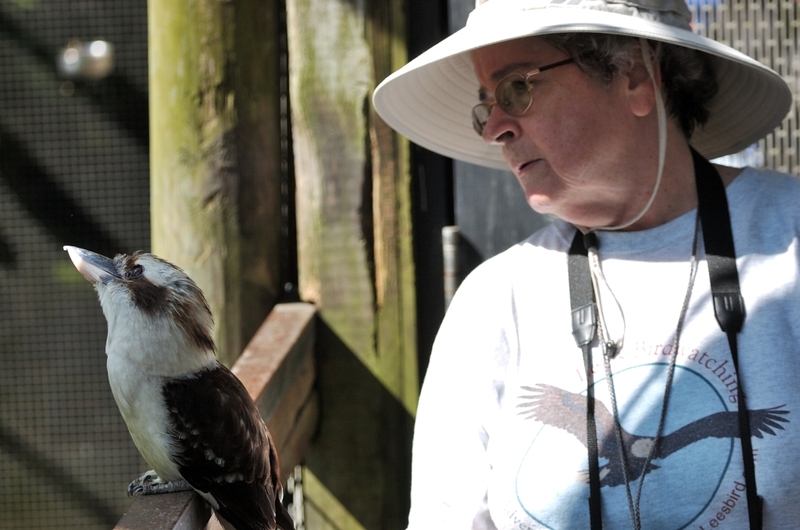 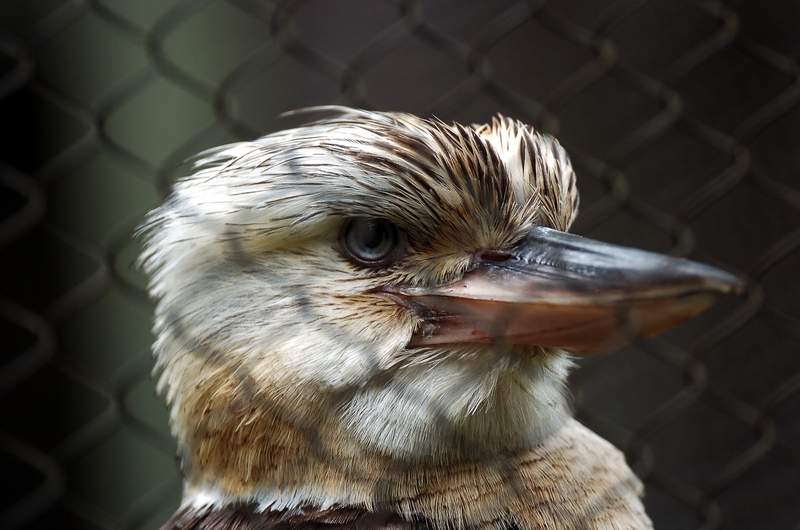 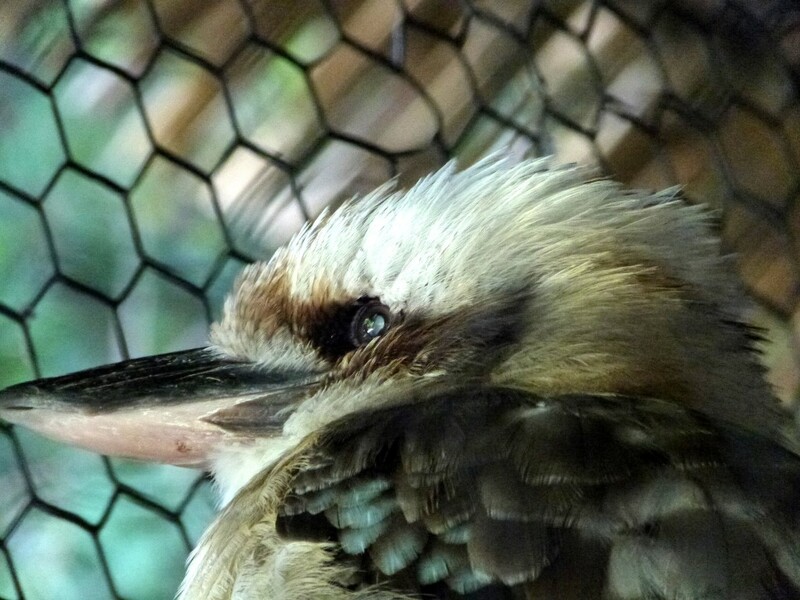 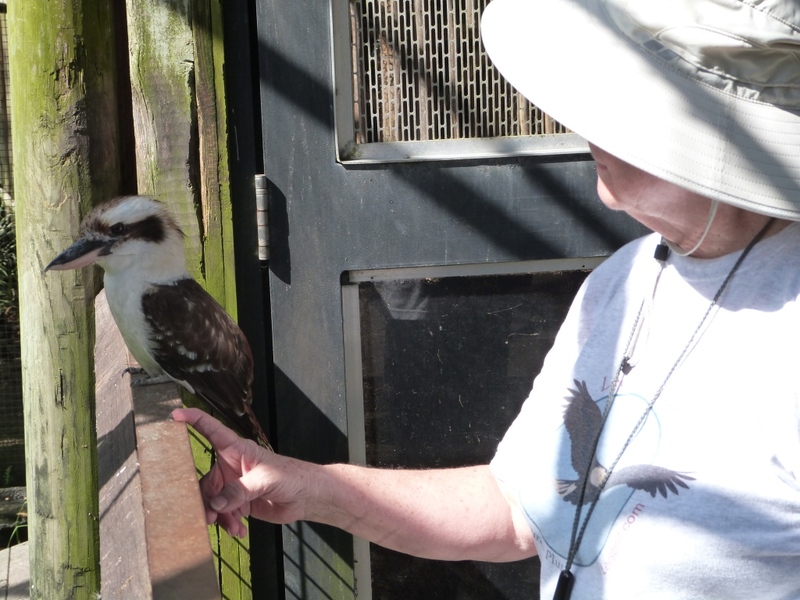 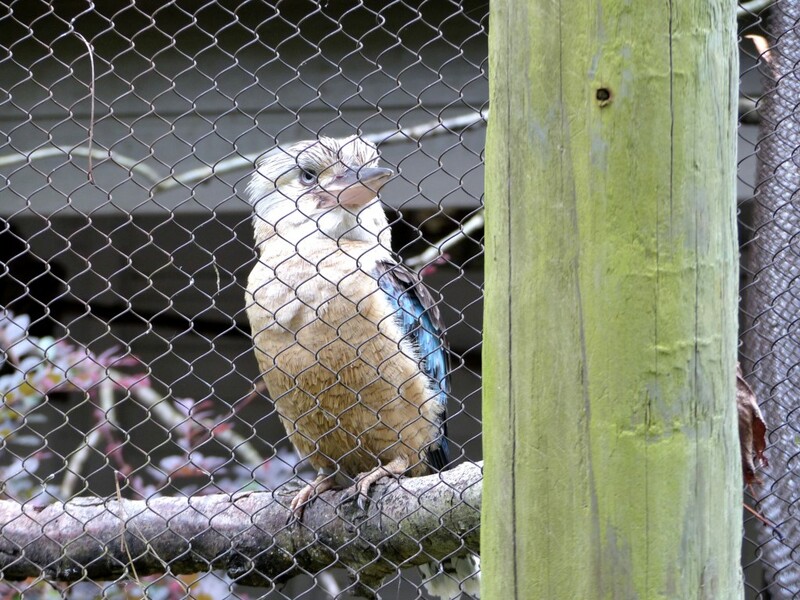 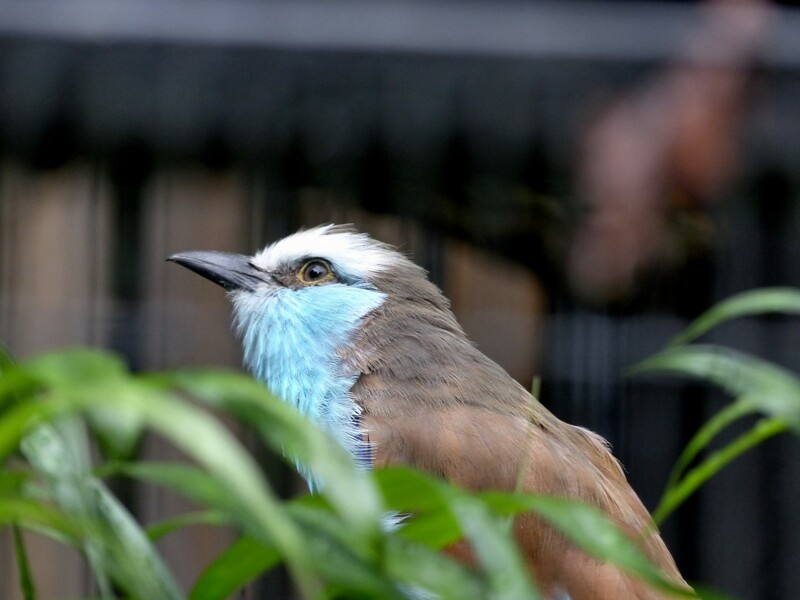 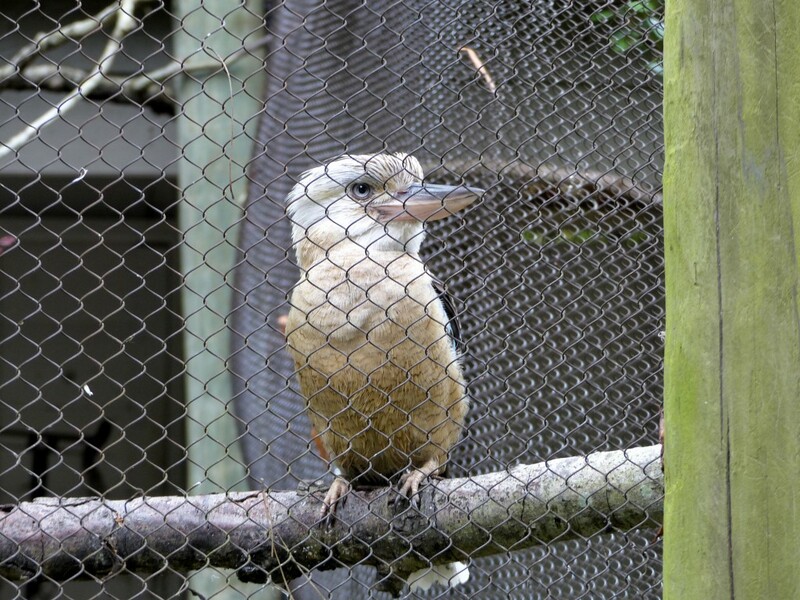 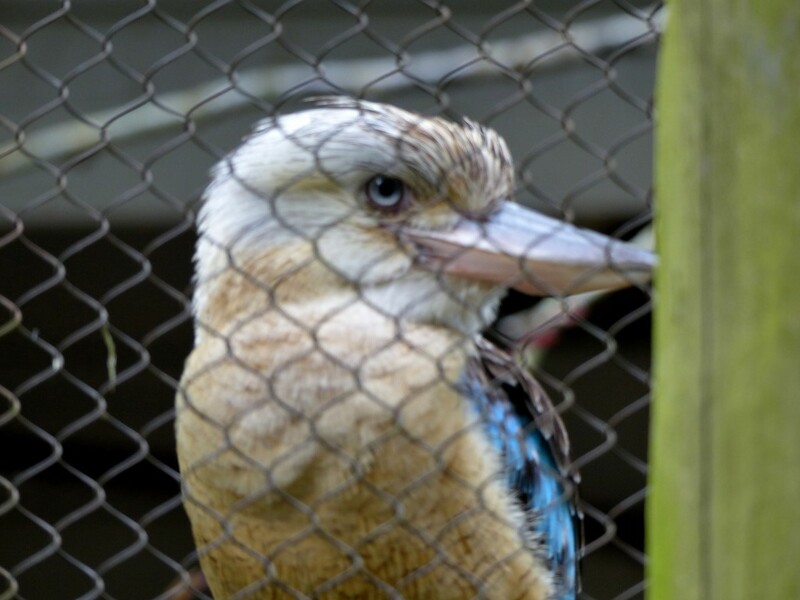 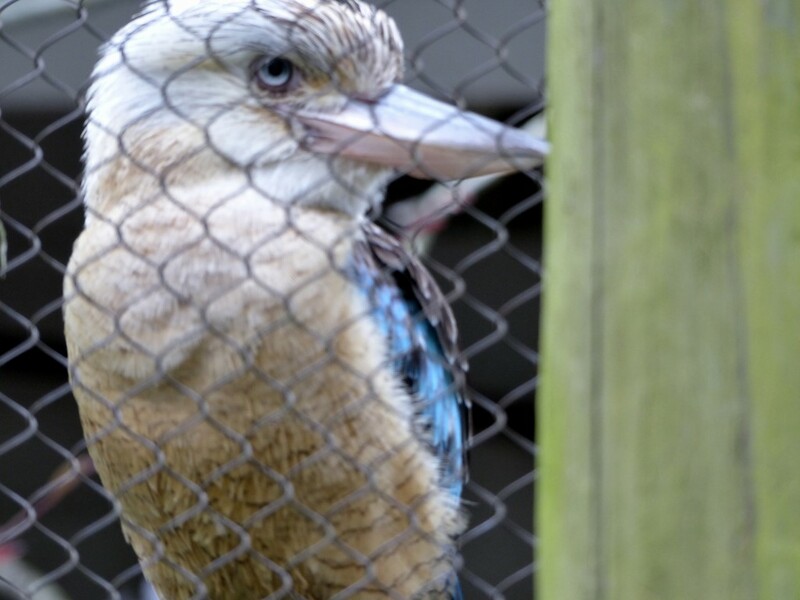 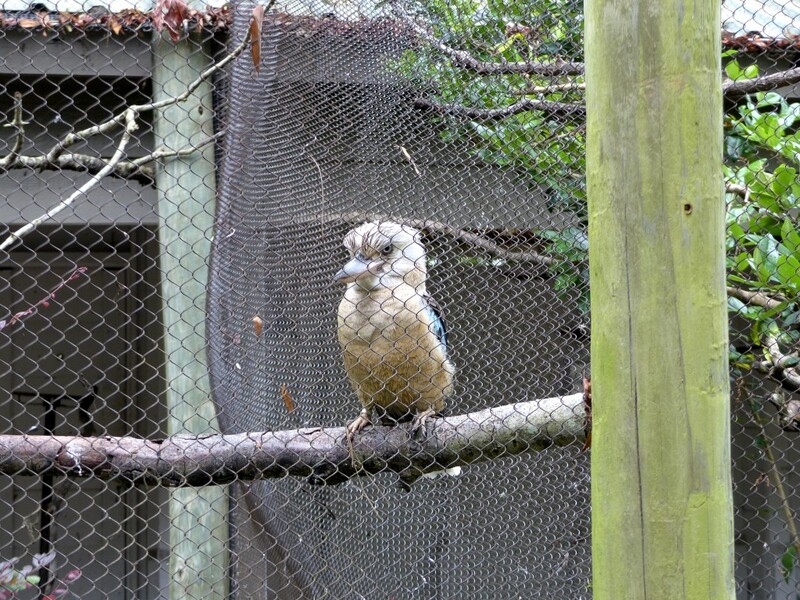 While we were at the National Aviary last summer, we had the privilege of seeing and hearing the Kookaburra in action. 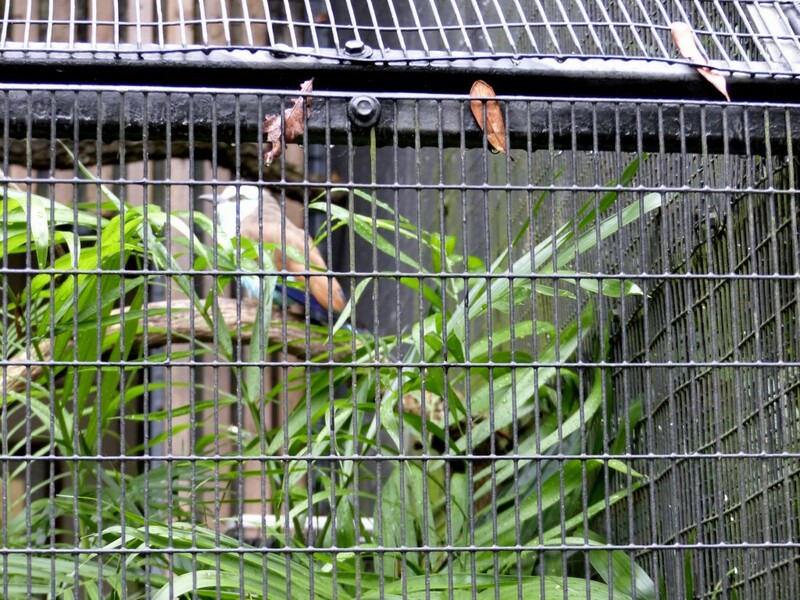 Below is the video I took up there. 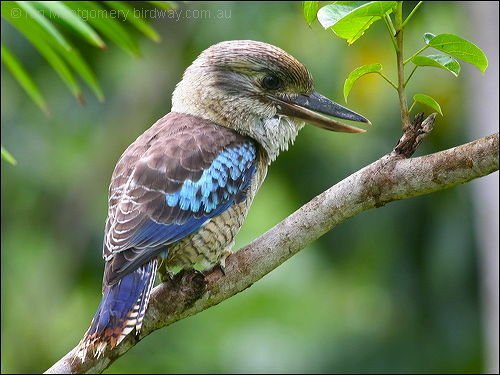 The Kookaburras are in the Alcedinidae – Kingfisher Family of the Coraciiformes Order. 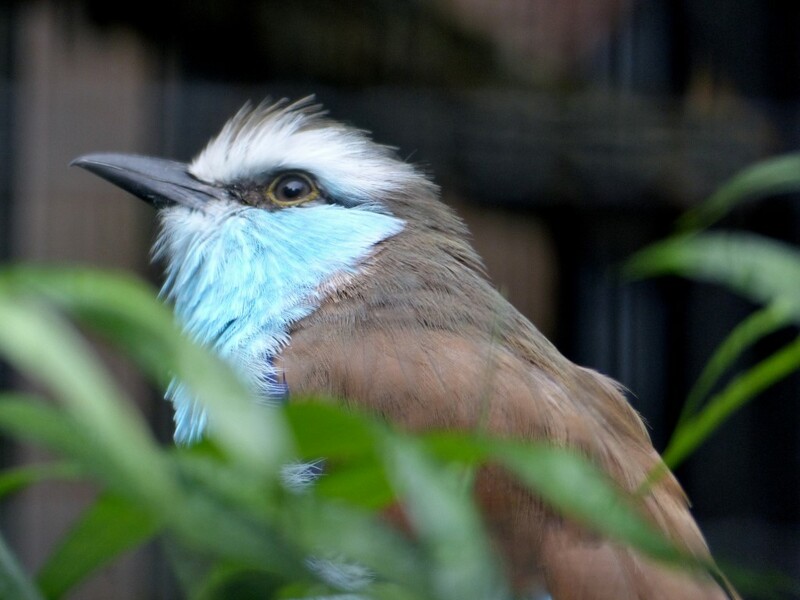 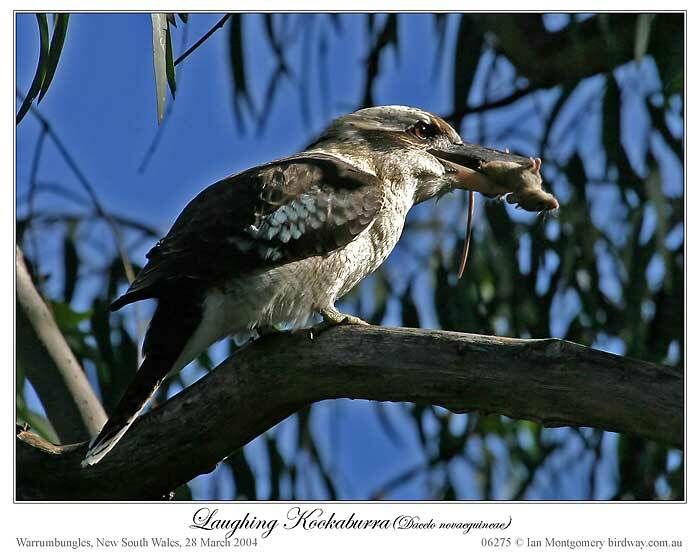 The 5 Kookaburras are the Shovel-billed, Laughing, Blue-winged, Spangled and Rufous-bellied Kookaburra.